I’ve been glad to have DutchCrafters as a long-time advertiser on this site. I thought it would be nice to hear a bit about how this furniture business got started, and how it works with Plain craftsmen today. Below, DutchCrafters CEO Jim Miller shares answers to five questions about his interactions with the Amish and how his business works. I hope you enjoy it. Special thanks to Milca Rivera and Debra Gingerich at DutchCrafters for helping put this together. Jim Miller grew up Mennonite in an Amish and Mennonite community in Goshen, IN. He worked with the Amish as a teenager in his uncles’ restaurant. When he decided to open his own e-commerce business, he developed a plan, but struggled to decide what products to sell. His business partner suggested that he look to his roots for the answer. While tossing around ideas with a friend who owns a landscaping company in Sarasota, FL, Jim noticed the lighthouses his friend incorporated into his landscaping. It turned out the lighthouses were created by an Amish vendor in Pennsylvania. Jim and his wife Linse traveled to meet with the vendor, and began to successfully sell lighthouses online. 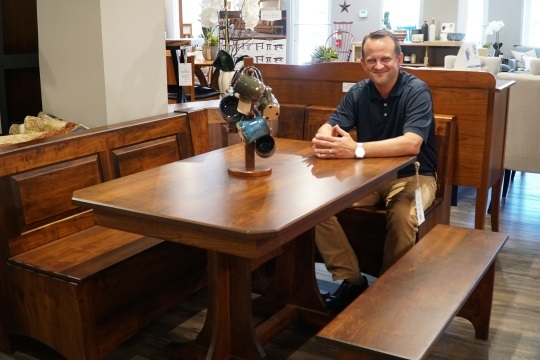 A few months later while looking for good quality, solid wood furniture for their home, and coming up empty-handed, Linse suggested to Jim that they sell Amish-made furniture. Thirteen years after starting DutchCrafters, the company now works with about 180 vendors in three states and sells more than 10,000 products online. As another record year comes to an end, Jim shares a few of the things he has learned from working with the Amish. 1. What is your favorite part of working with the Amish? 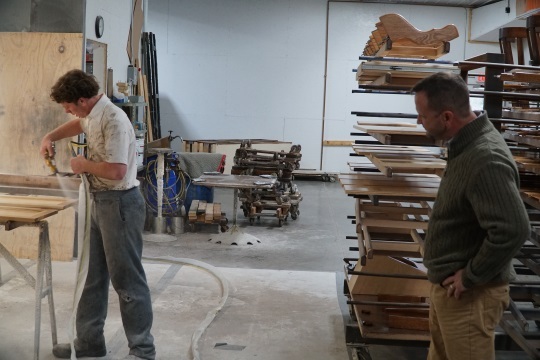 Jim Miller, Dutchcrafters: I think my favorite part of working with the Amish, having lived in Florida for a while and then reconnecting with Amish people in their shops, on their farms, and in their homes, and has been the simplicity in their lifestyle and theology. A lot of people put the Amish people on a pedestal and that’s not healthy or appropriate, but there are certain values that they live out that I think add a lot of integrity to them. Linse and I, our lives have been enriched by seeing how they live. For example, after sitting with the Amish for a meal in their home, we go outside, and the kids are all there, and we have ice cream and watch the stars. That is a quick snapshot of what I’m talking about. We never do that here. We are just busy all the time. I see it in their work, their woodshops and their interpersonal relationships. I see it in the small things like not always being rushed in a conversation that they’re having. That’s refreshing. 2. What is the most challenging part of working with the Amish? Without a doubt, it’s the communication. Many of them have adapted technology to fit their context and they have found the right loopholes to at least have access to a telephone, but the lack of email slows down communication. This is a very manual painstaking process. It has repercussions for how we sell our furniture, how we do order status, and our cost structures. It’s not a bad thing; it’s just a challenge. 3. Are there any Amish business practices that you think other companies and individuals in business should consider emulating? The Amish vendors we work with are business savvy. They want to sell products and grow their business. The Amish care about their bottom line, but for the Amish the bottom line is not an end to itself. Everything they do in business is for the good of the community. It is not socialism, it is not perfect, but if the Amish determine that a business decision might be good for the business but bad for the community, I have seen instances in which they will rethink that business decision and look for alternatives. I think that is one of the most important lessons that businesses outside the Amish community could learn from the Amish. Also, another practice is the ecological dimension. I don’t think the Amish would talk about it in this way, but they believe in the goodness of the earth, goodness of creation. They care about the earth and they care about sustainability, which they would talk about more in terms of stewardship. That sort of thing has implications for the community that is not only outside their business, but also inside their companies. 4. What are some of the unique aspects of working with the Amish? The thing that stands out in my mind is the close-knit relationships. There is a lot of interconnectedness. We started in Pennsylvania, then moved to Ohio, then we decided to try to do business with some of the vendors in Indiana. We found a lot of reluctance at first as they had bad experiences with other companies. I ended up drawing upon my own Amish heritage. I would nonchalantly mention that my uncles used to own a restaurant at the Topeka Livestock Auction (located in Topeka, IN) and they would say, “Oh, those were your uncles.” So being able to make those connections, being a part of the community, was one of the things that helped us get in the door in Indiana. We went where the Amish population centers were. Indiana, Ohio, and Pennsylvania are the three big states. There might be a few other lone furniture makers out there beyond that, but they’re not part of that network and that fabric I’m talking about. For example, a dining room table that gets made in PA, gets the skirting made in Ohio, and the chairs come from Indiana. There are those connections, so it’s really made by a community. 5. If there is only one thing you could take away from working with the Amish, what would that be? I talked about simplicity earlier. Another one I would mention, if you boil it down to one thing, is authenticity. I think that term speaks to origins of something that includes a dimension of integrity but is more than that. We are what we say we are. We try to work in ways that reflect honest values so we’re not selling something that we didn’t do or didn’t make. We represent ourselves. What you see on the outside is what is reflected from the inside. That’s true of furniture, and that’s true of people. I think that’s what we should aspire to. 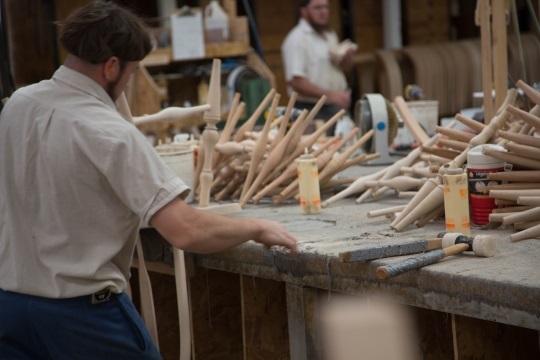 Thanks to Jim for the insights into the Amish furniture industry. If you or a loved one are in the market for furniture, or might be one day, you can check out what DutchCrafters has to offer here. Growing up in the 50s and 60s values and integrity were a part of most businesses, especially the many family owned businesses. As corporations have taken over family businesses values and integrity have gotten lost and we now see them as novelties. I worked for Kmart when before and after Mr Kresgie (spelling?) died. Big difference in the way they treated employees and thus the way employees treat customers. Same with Walmart. The values and integrity of Walmart took a steep dive after Mr. and Mrs. Walton died. I agree with you, Debbie. I worked at a Walmart before “Mr. Sam” died, and noticed the difference in the whole “atmosphere” afterward. It seems to me that the “values” of the founders of many family businesses (Englisch) get buried with them, unfortunately. Although it may seem a little odd talking Kmart and Walmart in response to a post about the Amish and DutchCrafters, it fits because the contrast is really significant. 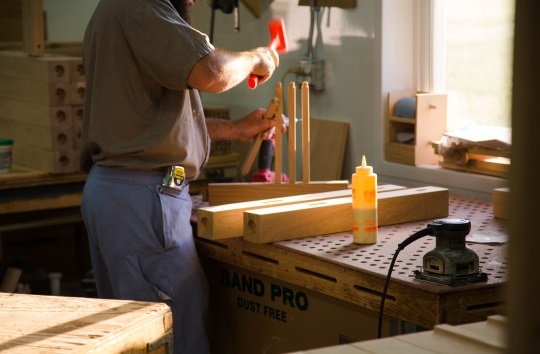 Though I have never had the occasion to deal with DutchCrafters, I have dealt with numerous Amish business people over the past 30 to 35 years and the experience has always been more than rewarding. When Sam Walton was still running the show, if you were shopping there & couldn’t find something you could just stop an employee and ask them where it was located. Without fail they would say; “Let me show you ” and they would stop what they were doing so they could walk with you to the spot where the item could be found. Now they either wave their arm and without looking at you, say: “I think it is over on aisle 11” (which may or may not have been correct), OR, just give you a totally blank stare and a “I don’t know”. I could go on for another 20 paragraphs about how much Walmart has slipped since Mr. Sam passed away, but suffice to say that Debbie and Alice Mary nailed it. I’ll have to check out this DutchCrafters outfit. Sounds interesting. I am a small roofing and siding contractor. I have struggled for years with the regular American workers and all the regular construction worker problems. I now use a Mennonite crew and it is enjoyable to work with them. They are honest, respectful and naturally do a good job. They take the normal construction stress out of my life. The worst thing I have to deal with is I better be there by 6:30 and have all the materials needed to do the job. They do all type roofing and siding for me. Shingles, flat roofs, metal roofs and vinyl siding.